Chocolate coconut ladoo, an easy sweet made with desiccated coconut, condensed milk and cocoa powder. I have posted the popular 2 ingredient Coconut ladoo recipe some years back. 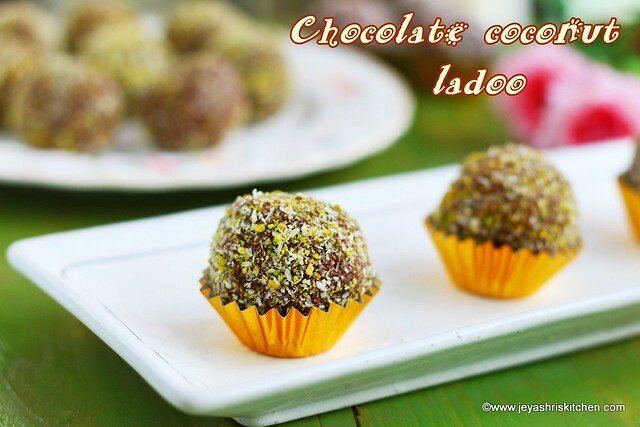 This recipe of chocolate coconut ladoo is similar to that but with the addition of cocoa powder and rolled in pistachios and desiccated coconut. Check out my full collection of Diwali sweet and snack recipes. Stay tuned for diwali recipes from Jeyashri's kitchen. In a heavy bottomed pan, add the desiccated coconut and condensed milk. Mix this well and cook for 5 minutes. Cook this for 5 more minutes and the mixture will come to a whole mass. Mix this with the 3 tblsp of desiccated coconut. Take a small lemon sized portion of the coconut mixture and make into a round ball. Roll this into the desiccated coconut mixture. Chocolate coconut ladoos are ready. Store this in a dry air tight container. 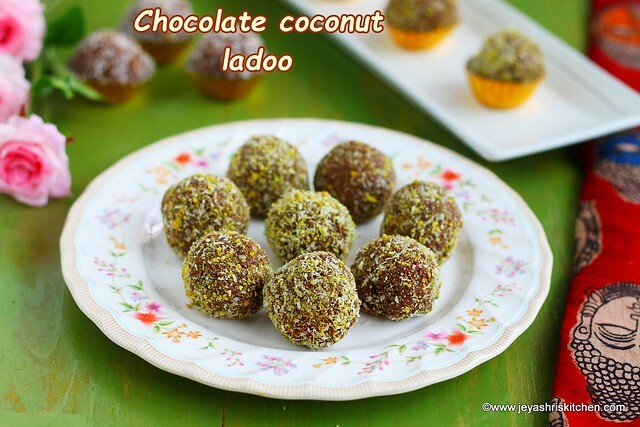 This chocolate coconut ladoo stays good for 2-3 days. Always keep this in a refrigerator. If you feel the mixture is still loose, add little more desiccated coconut and mix it well. You can also roll this into powdered dry nuts too. Do not cook the mixture long time after adding the cocoa mixture. It may turn bitter. You can add few drops of Vanilla essence to the coconut ladoo.